When I played in the youth symphony, it was our tradition to open up our concerts with an overture. Sometimes it was an overture proper, sometimes a tone poem or a song. Whatever its musical classification, it was a fairly short, tonal piece, never very complex and usually valuing melody over harmony. Depending on the day, the symphony might play two such pieces. Our conductor believed that these short pieces offered the audience a chance to relax, put aside their worldly concerns and gently adapt their bodies to their seats and their minds to the music. It also allowed the musicians, too, to get into the spirit of the evening. Only then would we play our longer pieces, the symphonies and such. At the end of the performance we would always play a short, lively, rhythmic piece to tie up the evening and send the audience home in a cheerfully satisfied mood. Many orchestras have abandoned that structure in their programs. They launch audiences directly into, say, a Beethoven symphony, or a Dvořak concerto without so much as a warning. Audience members have struggled for the past ten minutes to find parking and have rushed into the theater to find their seats all of thirty seconds before the lights go down. They are suddenly greeted with densities of counterpoint and harmony that challenge the lay listener even when the lay listener is relaxed and focused. The orchestra simply ignores whatever conditions they may come from and expects a brutal obedience to the music and the event before the audience have even had a chance to breathe. After a half hour or more of trying to get used to this, they are often faced with another equally long piece and then, if they are lucky, an intermission. The concerts generally conclude with another long work and rarely end with a short piece to ease the audience back into their workaday lives. Audiences leave the auditorium with the strains of the Tchaikovsky Sixth Symphony or the Brahms Fourth in their nerves–not exactly a delicate feeling. This is not only unfair. It is harmful. It harms the audience that is already there but more importantly it harms the audience of the future. People come to associate a night at the symphony with a dissonant state of mind, with an environment that is stiff, cold, brusque. The consequences of that should be obvious. I thought about this last night watching Black Grace at Meany Hall. The troupe performed beautifully in their three pieces, including the Seattle premiere of Vaka. As a sort of throwback to my old days of youth symphony, their first two pieces were short crowd-pleasers. In the symphonic world one might call them lollipops. The first, Pati Pati, seemed especially designed to get the crowd moving. 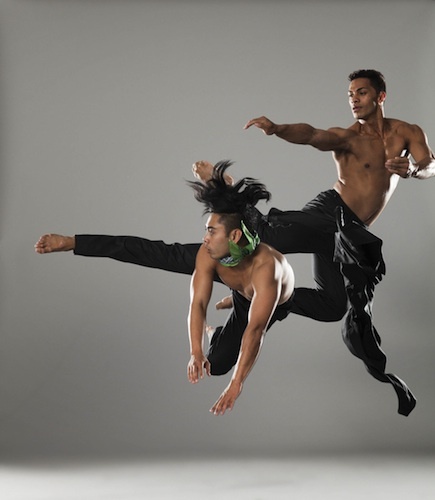 Condensed from four other full-length works, Pati Pati was an elaborate interlocking dance based on body percussion forms from the South Seas. One could hardly resist such a forceful and elegant display of the human form moving in perfect sync, pounding out primeval rhythms with their hands and feet. I absolutely love that kind of work and this was an exceptional treatment. The second piece, Amata, was more delicate. Originally for twelve female dancers, here it was reduced to a spare structure. The movements of the piece were projected onto the floor as abstract white lines, part letter, part ideograph, and the dancers used these lines to form a visual language for communicating between themselves. But this communication was anything but simple. It was by turns acceptance and argument, rage and release, ultimately going beyond language toward stillness. It was almost diametrically opposite in temperament from Pati Pati but every bit as beautiful. If the first two pieces were the overtures, the last piece is the symphony, Vaka. 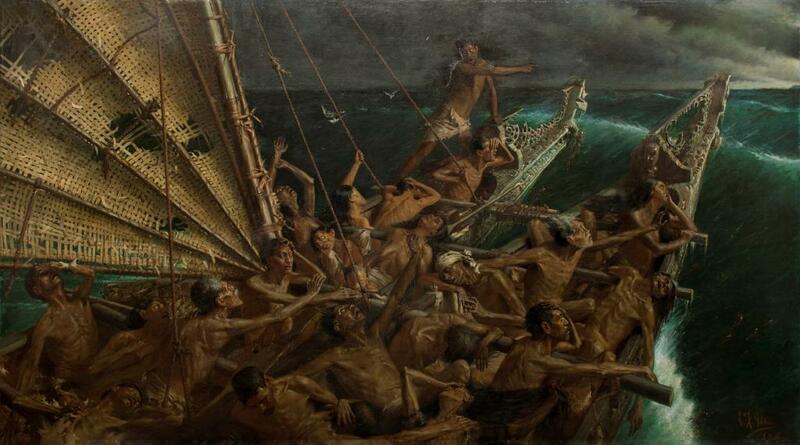 It is a dense piece, dealing with the cultural journey of New Zealand and urging a return to its roots. The imagery mixes dance and video and has its roots in two sources: Bill Viola’s video work, The Raft, and Louis Steele and Charles Goldie’s painting, The Arrival of the Maoris in New Zealand. The Viola installation and the Steele/Goldie painting both have their roots in Géricault’s painting, The Raft of the Medusa. The first section is obviously primordial. It evokes not Géricault but rather Eadweard Muybridge in its use of the walking human figure. The original men and women walk in a procession from right to left carrying each other (and their values) toward a new land. The second section animates the Géricault imagery through dance and also projected imagery. It shows the Primordial Tribe making its journey across the waters to their new home. Many are lost along the way. Men and women are separated from each other and suffer much travail as the ruthless waves drown them at random. Finally they reach land in their tribal vaka taua and begin to settle down, but as they do, they begin to change. They go from honest workers sharing their lives with each other to dreamers who visualize another world. The section closes, in fact, with one of the female dancers curled up on a sheet onto which is projected a series of images that build up like a travelogue and a showcase for the beauty of their lives. The woman is gradually drawn slowly away on that sheet offstage, disappearing into the darkness with her fantasies. Civilization is the subject of the middle section. As their clothing changes from tribal to European, the “boys” play rugby (a further indication of European colonization) and the “girls” wear prim dresses and play hopscotch. Beneath this, though, there is a strain of violence. The competitive games of Europe bestow competitive values on the people, and they begin to argue, to fight, to establish territory, to strive for alpha position on the playground. 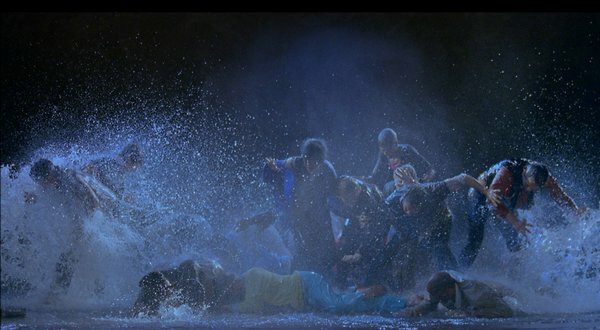 Still from The Raft, by Bill Viola. This leads consequently into the next section which starts out as a massacre. The stage goes dark and then video imagery is projected onto to naked backs of four dancers: atomic bomb discussions, reports from 9/11’s World Trade Center, and, I think, the Subway Sarin Attack in Tokyo, along with other violent images that are a natural consequence of the European values learned in the society. Slowly the dance begins to turn backward and return to tribalism. The dance ends by the dancers marching in procession from left to right–the mirror image of the dance’s opening section. The imagery of Vaka is extremely potent. It moves easily between dreamlike beauty and hard brutality. It is profound and extremely powerful. As I left Meany Hall I heard numerous people talking about the piece, all the way until I had crossed the bridge–a sure sign of the work’s effectiveness. Yet also at the end of the piece the audience seemed not to know it was over. Then the curtain finally rose and the crowd began slowly to applaud, but the applause quickly reached a loud crescendo. Even before I made my way to the doors, the crowd seemed confused, and even a bit roiled–one might even say unfulfilled. What happened, I think, was that the intermission was ill-placed. I question why the audience needed an intermission at all. The first two pieces totaled no more than twenty-five minutes. They were perfect “overtures” for the “symphonic work” that came after intermission. After two rather light crowd-pleasers, the audience was ready for Vaka. But tradition seemed to dictate that there be an intermission to separate the two halves of the evening. Intellectually I understand the need for an intermission. Vaka is quite long by itself and undoubtedly the gambit is that audiences cannot sit through ninety minutes of dance at once. The logic is probably sound. In some sense, then, the intermission last night was a “necessity.” But its effect was deleterious. It completely altered the audience’s expectation of the new work and made them struggle–unnecessarily, I think–with a piece they were already primed to accept after having been gently introduced to the rhythm of the evening by Pati Pati and Amata. I should have preferred another short piece, even one of five minutes or less, to precede the longer work. This would not only have made the evening more symmetrical, it would also have maintained the high level of attention and generosity built up by the opening two works. Still, this is an absolutely gorgeous show. Black Grace are a fine company. Artistic Director Neil Ieremia’s choreographic eye and restlessly probing spirit are on fine display here and his dancers are phenomenal. I only wish Seattle could spend even more time with this bright artist. One more piece, in the right position on the program, would have done nicely.